Merry Christmas! 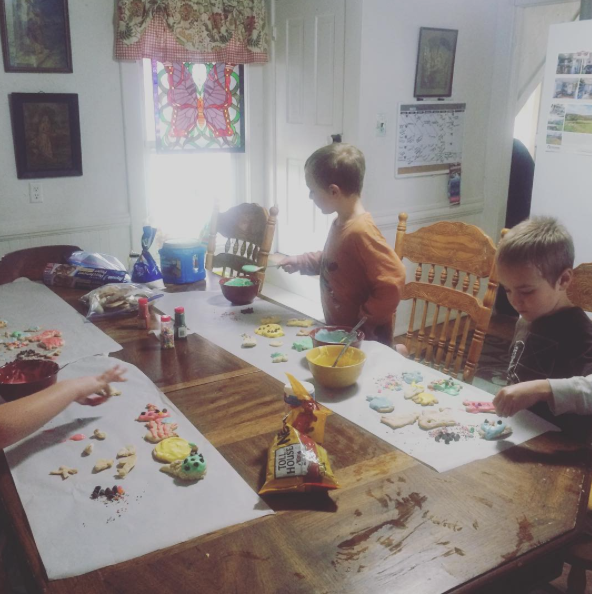 Over the last several weeks we’ve been enjoying mixing in holiday baking as homeschool curriculum (if you’re interested you can also find over 100 recipes to mix in with homeschool baking). We’ve put my simple new hand mixer to work these last two months. Over Thanksgiving we made our first ever homemade pumpkin pies using real pumpkin (it even works for breakfast and we fed the leftover pumpkins to the chickens, too). 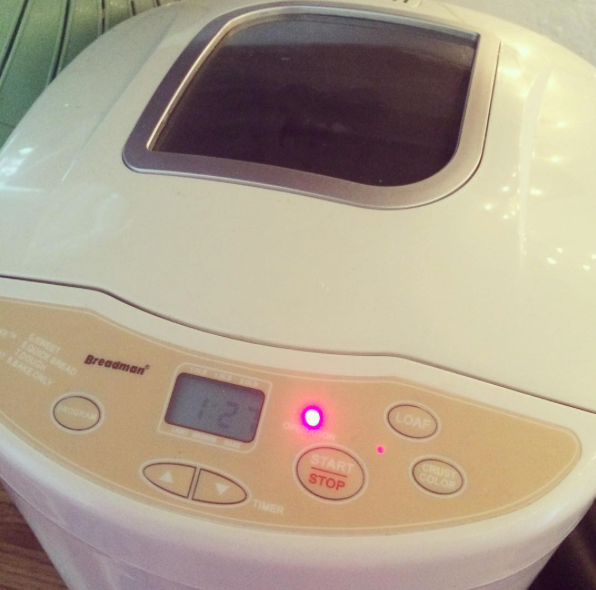 I finally got the bread machine going and the kids and I have enjoyed trying out new recipes. We’ve also made roll out sugar cookies and decorated those with homemade icing (here’s my roll out sugar cookie recipe and old fashion no bake chocolate oatmeal cookie recipe). We had a family member come over and make 18-dozen peanut butter cookies with the kids as well. 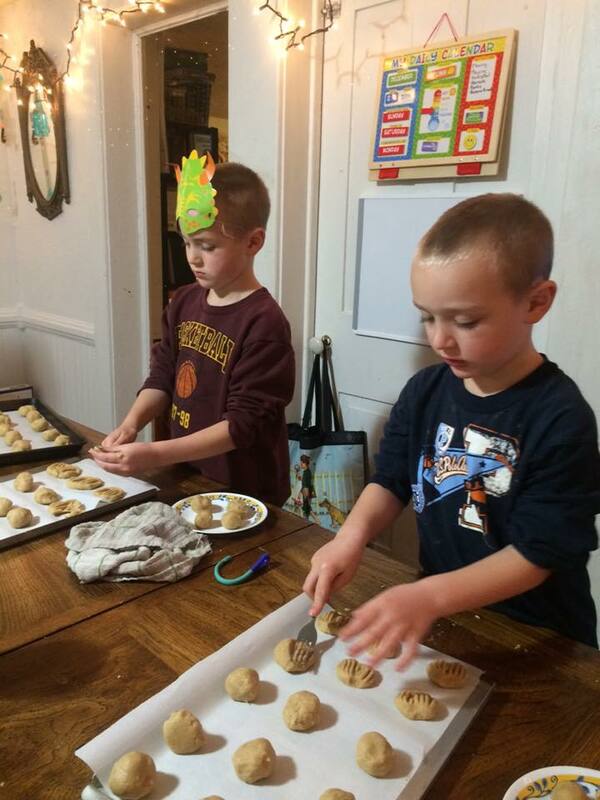 Gabriel and Liam loved smashing down the peanut butter cookies and adding sprinkles. 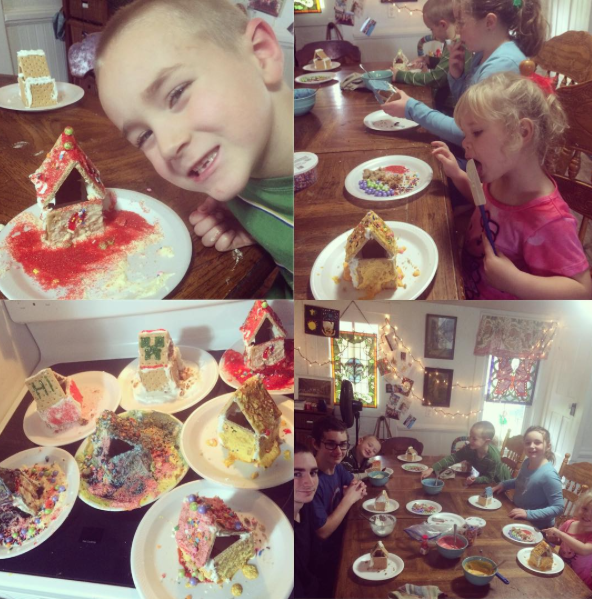 This year we made homemade gingerbread houses based on this easy and fun recipe idea from my friend Connie of Smockity Frocks. Here’s Smockity Frocks Gingerbread houses. You just use graham crackers and Connie’s recipe for Royal Icing. It worked perfect! 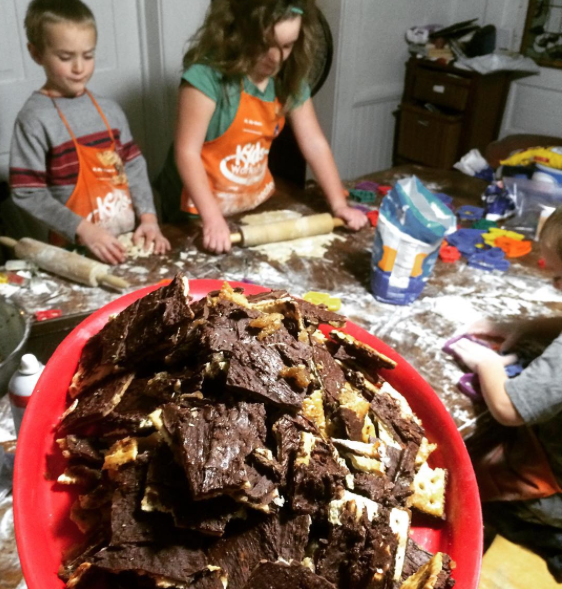 A recipe that was new to us this year is called Christmas Crack. This may not be the nicest name, but this is the popular online name zipping around the internet. It’s also known as Saltine Toffee Candy, Old Fashioned Christmas Candy, The World’s Easiest Christmas Candy — whatever it’s called, it’s AMAZING! 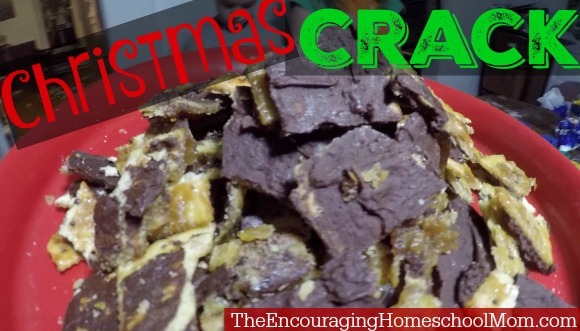 In today’s cooking vlog I share this super easy Christmas candy recipe, other wise known as Christmas Crack. This Toffee Candy is so good that you can make it anytime of year. I pray that all of you have a wonderful and blessed Christmas with your family and loved ones. We’re hunkering down here in the old farm house and enjoying my husband’s time off from college (he got all A’s in his first semester!). 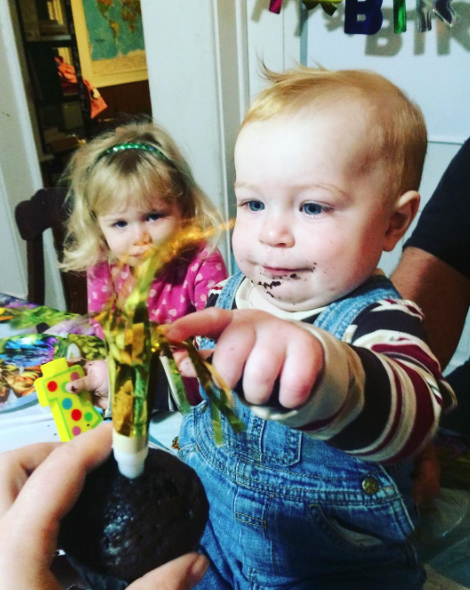 Family is coming to visit, Daniel had his first birthday, and Liam’s birthday is next! I’m praying for your family and I want you to know how much I appreciate your viewership, readership, and support. 2016 is going to be a fantastic year here on the upcoming The Encouraging Homeschool Mom blog. I have a huge product coming out for you in just a few days. 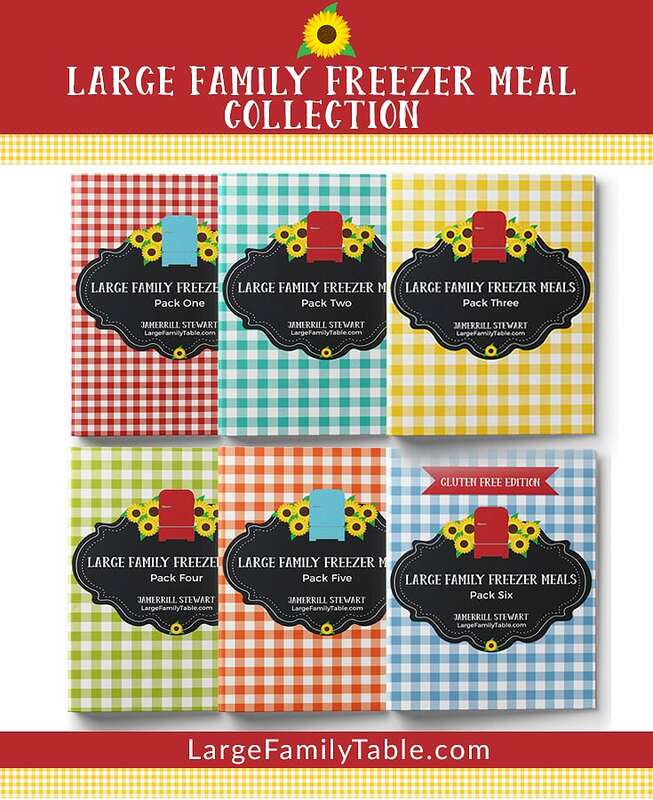 Subscribers of The Encouraging Homeschool Mom will receive this new product for FREE for a very limited time. If you’re not already signed up go ahead and do so now. What fun times you are making for your children. God Is good! This was the first year I made a candy similar to your Super Simple Candy. The recipe I used came from a Christmas Southern Living Book. It used Ritz crackers as the base and added pecans and white chocolate chips after you spread the milk chocolate chips. It turned out well and it was my favorite dessert this Christmas. Thank you for all your hard work and your sincerity in all that you do. I think your syrup in the candy was runny because you used margarine instead of real butter. Also I’ve always read and cooked it till it boils, not just melt. You’re basically making caramel with the butter and brown sugar. Margarine is made with oil instead of cream so it gets more liquidy when it melts. As long as it tastes good though, I guess it doesn’t matter!